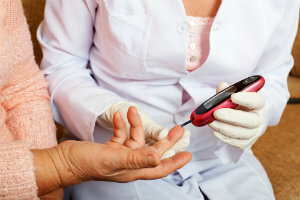 Diabetes is, by far, the leading cause of non-traumatic amputations in the United States, with about 75,000 cases every year. Most of those occur in the lower legs, where nerve damage and reduced circulation make it harder for your body to heal wounds and fight infections. There’s good news, though! Although diabetic complications in the feet and ankle can be extremely serious, they are also very preventable—if you make healthy foot care a priority. Are you doing any of the following things for your feet? Thoroughly check your feet every day. Make a complete visual inspection, using a mirror if necessary for those hard-to-see spots. Then, run your hands over your feet to check for bumps, lumps, or temperature changes. Even small cuts and scrapes can get infected and turn into a big problem if you aren’t careful, so don’t take risks! Give us a call if you notice any issues that are lingering or getting worse. Keep your feet clean and moisturized. A daily wash with warm water, followed by thorough drying, keeps skin infections like athlete’s foot away. Avoid dry skin and painful heel fissures by using lotion or moisturizer. Protect your feet from injury. Breathable, seam-free socks and cushioned, well-fitting shoes are a must at all times, including when you’re home. Check inside your shoes before you put them on to make sure there are no foreign objects. Trim carefully. Nails that are too short, or are curved from corner to corner rather than cut straight across, are more likely to become ingrown. Schedule your annual professional exam. We strongly recommend anyone with diabetes get their feet checked at our office at least once per year. During that appointment, we’ll test for any signs of circulatory problems or nerve damage—getting treatment for these as early as possible is critical for reducing your risk of diabetic wounds and complications. We can also help you pick out new shoes or fit you for orthotics, suggest healthy diet and exercise strategies, and provide whatever other preventative steps are necessary to keep your feet healthy and strong. With a solid plan and a little discipline, almost all diabetic foot complications are 100% preventable—and that means diabetes doesn’t have to stand in the way of years of healthy, happy living. To schedule your appointment with a member of our Austin Foot and Ankle Specialists team, please complete our online contact form or give us a call at (512) 328-8900.